A light-hearted book about books and the people who write them for all lovers of literature. Which famous author died of caffeine poisoning? Why Alice’s Adventures in Wonderland was banned in China? Who was the first British writer to win the Nobel Prize in Literature? What superstitions Truman Capote kept whenever he wrote? Who the other Winston Churchill was? 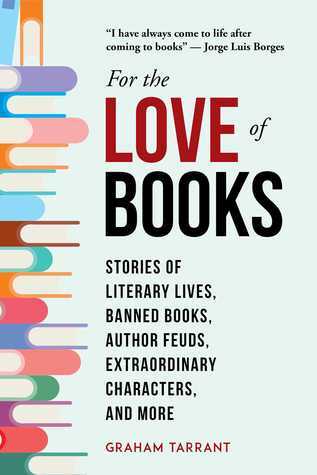 A treasure trove of compelling facts, riveting anecdotes, and extraordinary characters, For the Love of Books is a book about books—and the inside stories about the people who write them. Learn how books evolved, what lies behind some of the greatest tales ever told, and who’s really who in the world of fiction. From banned books to famous feuding authors, from literary felons to rejected masterpieces, from tips for aspiring writers to stand-out book lists for readers to catch up on, For the Love of Books is a celebration of the written word and an absolute page-turner for any book lover. For the Love of Books is a delightful collection of anecdotes, some of which I knew, others of which were new to me. Overall, this is a volume that should delight any booklover looking for some light-hearted reading about their passion. My only gripe was when the author let personal opinion get in the way. For example, he lists names of Nobel Prize-winning authors who he claims no one has heard of, yet one of them is in my Top Ten Authors list, so it's a sweeping statement to say they are completely unknown and, as he seems to suggest from that, unworthy. Likewise, he expresses disdain for self-published authors, suggesting no self-published works are properly edited. This, too, is erroneous. I am a qualified freelance editor and work predominantly with self-publishing authors. I am friends with many other self-publishers, none of whom would release an unedited work. Some people out there may, it's true, but there are also many excellent self-published works. Comments like that rankled me and may upset others too. However, setting aside those occasional personal interjections from the author, there's a lot here that will appeal to the avid reader, and the book would make an excellent gift for any bookworm.